Not currently under active development. Active development may resume in the future. Bug reports will be triaged and fixed. No guarantees are made regarding fix timelines. Feature requests will be triaged. No guarantees are made regarding acceptance or implementation timelines. Pull requests from external contributors are not currently being accepted. No interruptions. The inline prompt we provide can be inserted right into your view hierarchy and customized to complement your existing UI. Users are free to interact with the prompt as much or as little as they like. 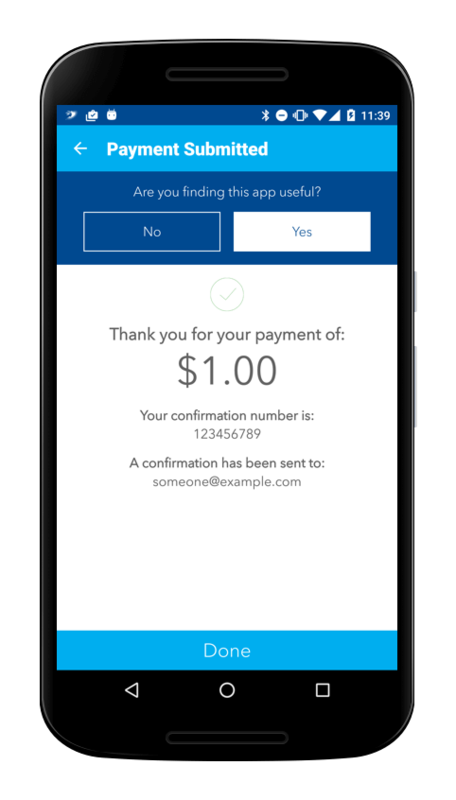 This approach shows respect for your users and preserves the app flow you have carefully crafted. No nagging. amplify intelligently tracks significant events to make sure your users are only prompted for feedback at appropriate times. Users with positive feedback are asked to leave a quick rating or review in the Google Play Store, improving the rating and discoverability of your app. All of these ratings and reviews reflect genuine user experiences - amplify just makes it easier for happy customers to choose to share their appreciation. Users with critical feedback are instead asked to send a more detailed email that will automatically include pertinent app and device information. This gives you an opportunity to engage these users in a more meaningful dialogue, allowing you to better understand and accommodate their feedback. Easy to integrate. Default prompt timing rules allow you to get up and running as quickly as possible. Easy to customize. Use both built-in and custom events to create a collection of prompt timing rules. Tweak the provided inline prompt UI via XML or in code. These components are designed to complement each other, and combining them as described in the Getting Started section below is the easiest way to integrate amplify into your application. However, it is perfectly possible to couple the prompt timing calculator with your own prompt flow and UI if desired. (This could be useful if you have highly-customized requirements for the prompt flow.) If you pursue this route, we would encourage you to ensure your prompting mechanism still reflects the principles outlined in the Introduction. * Be careful: don't re-prompt after a configuration change! * The provided prompt view classes handle saving and restoring their state. * Perform this check in onCreateView or onViewCreated if using a Fragment. That's it! The prompt timing calculator will evaluate the default rules each time promptIfReady is called, and instruct the PromptView to automatically update its state based on the result. If the user chooses to interact with the prompt, the sequence of questions asked is also automatically managed. If the user decides to give feedback, amplify will handle opening the appropriate Google Play Store page or email client with pre-populated details. It has been more than a week since a new version of your app was installed. We like to give users some time to settle in and explore the changes made in the latest update before asking them their opinion... but not so much time that their valuable first impressions are forgotten! It has been more than a week since your app last crashed. There are much better ways to collect detailed crash information than via user feedback. We're big fans of Fabric/Crashlytics. To save users from spending time reporting crashes that we are already aware of and fixing, we avoid asking for feedback right after a crash has occurred. The user has never previously provided positive feedback. We strive to constantly improve our apps' functionality and stability. 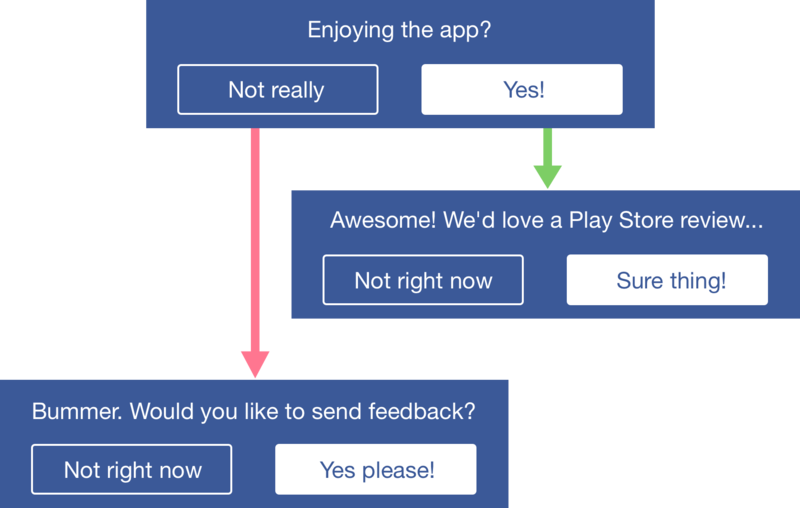 If we do our job right, there's little to be gained by prompting satisfied users for feedback repeatedly. If we decide to significantly overhaul our app (either internally or externally), we will reset the prompt timing calculator to capture feedback from our entire user base again. The user has not provided critical feedback for this version of the application already. Since it's unlikely that we'll be able to address any critical feedback received without releasing an update, we won't re-prompt a user who already provided insights into the current version of the app. More information on how to apply your own collection of rules is available in the Configuring section. Building custom rules is covered in the Customizing section. amplify calculates prompt timing based on two types of rule. These rules are based on the environment/device in which the embedding application is currently running. For example, they may query whether or not the current device is capable of handling a specific Intent. GooglePlayStoreRule: verifies whether or not the Google Play Store is installed on the current device. AmazonAppStoreRule: verifies whether or not the Amazon App Store is installed on the current device. .addEnvironmentBasedRule(new GooglePlayStoreRule()); // Prompt never shown if Google Play Store not installed. .setInstallTimeCooldownDays(14)   // Prompt not shown within two weeks of initial install. .setLastUpdateTimeCooldownDays(7) // Prompt not shown within one week of most recent update. .setLastCrashTimeCooldownDays(7); // Prompt not shown within one week of most recent crash. the event-based rule to be applied to that tracked dimension. CooldownDaysRule: checks whether enough time has elapsed since the last occurrence of this event. MaximumCountRule: checks whether this event has occurred fewer than N times, for some number N.
MinimumCountRule: checks whether this event has occurred at least N times, for some number N.
VersionCodeChangedRule: checks whether this event has already occurred for the current version code of the embedding application. VersionNameChangedRule: checks whether this event has already occurred for the current version name of the embedding application. WarmupDaysRule: checks whether enough time has elapsed since the first occurrence of this event. TODO: add a few more example rules to this snippet! new MaximumCountRule(1)) // Never ask the user for feedback again if they already responded positively. Test app UI; use me to explore! Use this if you are happy with the basic layout of the prompt shown above, but need to customize colors or wording! All attributes are optional. The most important are prompt_view_foreground_color and prompt_view_background_color. All other color attributes default to one of these two colors, so most use-cases can probably be supported by setting one or both of these attributes only. Use this if you need to provide a structurally different prompt layout, require custom fonts, etc. The prompt_view_question_layout attribute is required and subject to some additional requirements (listed below). All other attributes are optional. If prompt_view_thanks_layout is not provided, the prompt will automatically dismiss at the end of every flow. If it is provided, the user will see the thanks view whenever they agree to give feedback. A TextView subclass with id amplify_negative_button. If a view is found with an appropriate button id but it is not a TextView subclass, the library will gracefully no-op when trying to set the button text. A TextView subclass with id amplify_title_text_view. A TextView subclass with id amplify_subtitle_text_view. adjust other UI elements when the prompt view is shown/hidden. 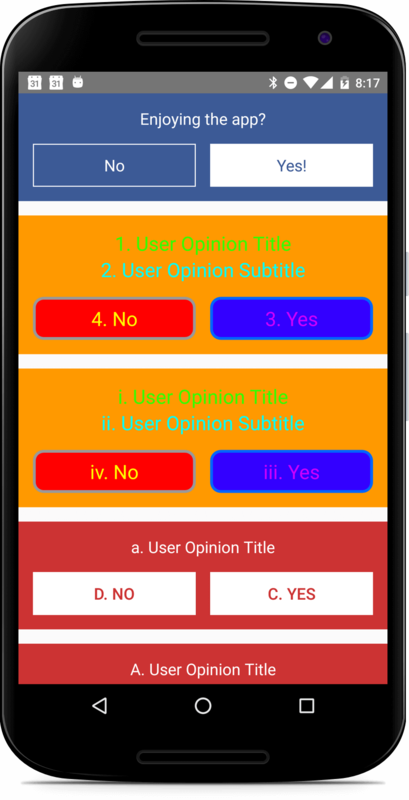 GooglePlayStoreFeedbackCollector: collects feedback via the Google Play Store. AmazonAppStoreFeedbackCollector: collects feedback via the Amazon App Store. DefaultEmailFeedbackCollector: collects feedback via email. Must be passed one or more recipient email addresses when constructed. As before, the dimension of the event that will be tracked is dictated by which registration method is called. The generic type T must be one of: Integer, Long, or String. The type you select will depend on which tracked event aspect (time, count, etc.) you wish to apply this check to. Reminder: use the provided DefaultLayoutPromptView and CustomLayoutPromptView classes whenever possible! prompt state is preserved through configuration changes (non-trivial!). To provide a totally custom experience in which amplify does not manage the prompt/rating/feedback UI flows at all, replace any calls to promptIfReady with calls to shouldPrompt. This method will evaluate all rules and provide a boolean that indicates whether every provided rule is currently satisfied. You may then use this hook to begin your own feedback request flow. Again, if you choose this route be aware that you are responsible for maintaining prompt state through orientation changes (if desired). The delayed nature of amplify prompts can make it hard to test effectively when integrated. We provide the following capabilities to help with this. By default, logging is disabled. To enable it, call the static method Amplify.setLogger before initializing the shared Amplify instance. The provided AndroidLogger class will be an appropriate choice for most users. If you instead wish to route amplify logs into an existing logging framework, you may supply your own implementation of the ILogger interface here instead. Supplying a custom shared preferences name in this manner will effectively 'reset' the library (since the new SharedPreferences instance will not contain any existing tracked data). This can be useful if you release a major app update and wish to prompt all your users for feedback again.